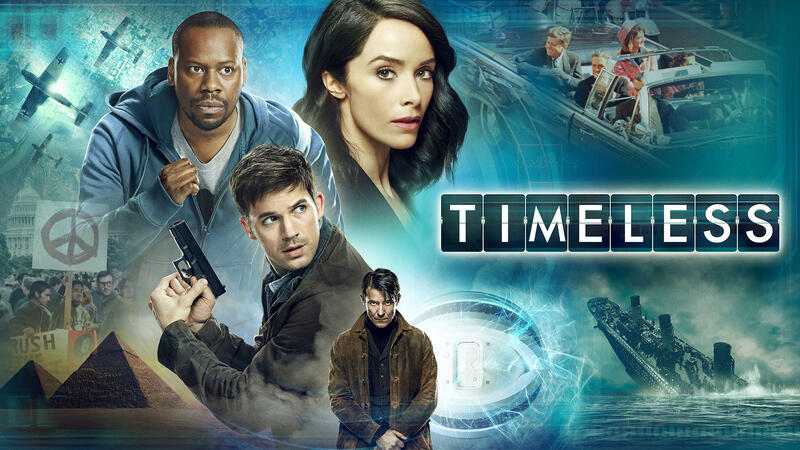 From Eric Kripke (Revolution, Supernatural), Shawn Ryan (The Shield) and the producers of The Blacklist, NBC’s Timeless, is a thrilling action-adventure series in which a mysterious criminal steals a secret state-of-the-art time machine, intent on destroying America as we know it by changing the past. Our only hope is an unexpected team: a scientist, a soldier and a history professor who must use the machine's prototype to travel back in time to critical events. While they must make every effort not to affect the past themselves, they must also stay one step ahead of this dangerous fugitive. Can this handpicked team uncover the mystery behind it all and end his destruction before it's too late? “Party at Castle Varlar” – Lucy (Abigail Spencer), Wyatt (Matt Lanter), and Rufus (Malcolm Barrett) are shocked when they’re told the mothership has landed in Nazi Germany, but time is short, and they’re the only ones equipped to kill Flynn (Goran Višnjić) and end his psychotic crusade. Now, in the midst of World War II and in hot pursuit of a genius with sinister associations, the team weighs the consequences of Flynn’s destruction, meets the man behind one of literature’s most popular figures – Ian Fleming (guest star Sean Maguire), and endures a very uncomfortable… party. Moderated by Deadline's Dominic Patten with cast members Abigail Spencer, Matt Lanter & Malcolm Barrett and EPs Eric Kripke and Shawn Ryan.